Multi-hit, random element damage to random allies. 3000 Wind damage to all allies. Plain Damage to all allies based on 50% of max HP (30% for trigger). Earth damage to one ally and switches them with a backline ally. Multi-hit Fire damage to random allies. Last hit deals ~700,000 Fire damage. , and removes all buffs on all allies. Removes all debuffs on Ultimate Bahamut. Earth damageVerification needed. to all allies. Water damage to all allies and removes 1 buff. Removable with Clarity-type skills on an ally. buffs have no effect while this field effect is active. Any allies below 5% HP will be instantly knocked out. 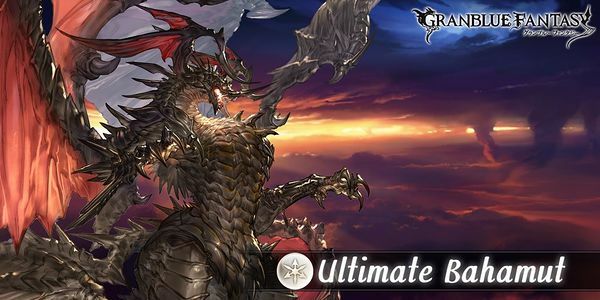 Unleashes True Power.Ultimate Bahamut strengthens its defense! 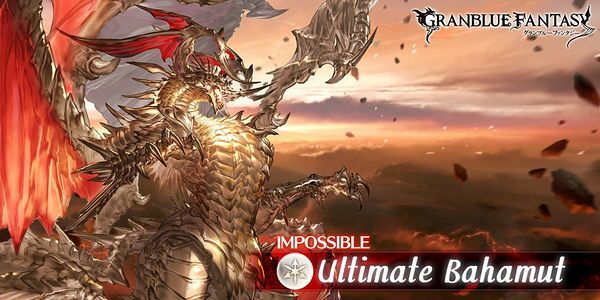 Unleashes True Power++.Ultimate Bahamut heralds the terminus of all life!
. (very low success rate)Verification needed. Normal attacks now hit a single ally and deal light or dark damage. Unleashes True Power+++.Ultimate Bahamut increases in power with every second! Drop table last updated: 2017-12-18, all stated drop rates are estimates. Participants: 6 Vice: 2nd-3rd Elixirs: Not available Strike Time: NoStrike Time does not apply for this raid. Location: Chapter 92 (99): Bestia Island - Resting Rill Start QuestNetwork Errors will appear if the hosting conditions are not met. 10000 Wind damage to all allies. Multi-hit Fire damage to random allies. Last hit deals massive Fire damage. Plain Damage (60% of max HP) to all allies. Switches two random frontline allies with backline allies (will not switch the main character). Removes one debuff from Ultimate Bahamut. Only happens to the player who pushed Ultimate Bahamut into overdrive. 4-hit Plain Damage (30% of max HP) to random allies. 4-hit multi-element1 hit of Fire, Water, Earth, Wind each to random allies. Triggers Ultimate Bahamut to cast Reason's Transcendence next turn for all parties. Plain Damage to all allies based on 100% of current HP. If Ultimate Bahamut casts Resounding Realm, it will cast Reason's Transcendence next turn for all parties in the raid. Casts Sirius (multi-element). Charge diamonds do not reset. Casts Sirius (plain damage). Charge diamonds do not reset. Removes all buffs on allies. Normal attacks now deal single-target light/dark damage only. Multi-hit plain damage and multi-element damage to random allies. 10,000 Dark damage to all allies. Casts Deadly Flare (Dark Version). Drop rate based on 4028 battles, 638 host red, 1146 mvp red. Please check the spreadsheets for up to date numbers. Drop table last updated: 2018-03-20, all stated drop rates are estimates. Ultimate Bahamut's design originates from Rage of Bahamut. This page was last modified on 15 January 2018, at 22:08.